SINSINAWA, WI, September 22-26, 2006 --At their 55th annual meeting, members of the Dominican Leadership Conference celebrated a person many Dominicans consider a national treasure. Sr. Nona McGreal, OP (Sinsinawa) was honored for her extraordinary service to the Dominican Family. 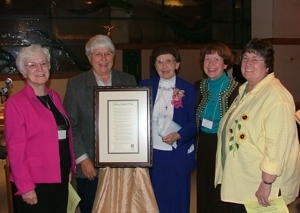 Sr. Nona, former director of Project OPUS, was honored by the DLC for her incalculable contributions to Dominican Lilfe, among other accomplishments: Dominicans at Home in a Young Nation:1786-1865, Volume I of The Order of Preachers in the United States: a Family History, the first comprehensive history of the Order in one single country. A formal proclamation was made on behalf of the DLC by Roberto Corral, OP (Holy Name) as President of the conference. Sinsinawa Dominicans share in the celebration of Sr. Nona McGreal at the DLC Annual Meeting: left: Diane Kennedy, OP, associate provost, Dominican University, Pat Mulcahy, OP prioress, Nona McGreal, OP, Janet Welsh, OP, interim director of the McGreal Center and Judy Miller, OP research assistant, McGreal Center. With obvious affection and admiration, members of the DLC noted the many projects undertaken and the leadership Sr. Nona has provided as she begins her seventy-fourth year of vowed life within the Dominican family. Sr. Nona researched and composed the Positio: Super Vita, Virtutibus EtFama Sanctitatis, the document that led the Congregation for Causes of Saints to declare Samuel Mazzuchelli, OP, founder of the Sinsinawa Dominicans, to be known as Venerable. Sr. Nona also authored the definitive biography, Journeyman, Preacher, Pastor, Teacher: Samuel Mazzuchelli: American Dominican. The high esteem in which Sr. Nona is held is not limited to members of the Dominican Family in the United States. In addition to the DLC honor, Sr. Nona was presented with a Nomisma Honoris by order of the Master General of the Order, Bro. Carlos Azpiroz-Costa. This citation is the highest honor and recognition offered to a member of the Order. Roberto Corral, OP (Holy Name) President fo the DLC, presented the citation to Sr. Nona along with other guests from Santa Sabina: Ed Ruane, OP (St. Albert) Socius for the US Provinces, Chrys McVey, OP (Pakistan) Socius for Apostolic Life, Marcio Couto, OP Socius for Intellectual Life and Margaret Ormond, OP (Columbus) International Coordinator of DSI. Later this year, Sr. Nona's nomination to the International Historical Commission of the Dominican Order will be complete. She will be the first woman to be so honored. The McGreal Center for Dominican Historical Studies is a partnership between the DLC and Dominican University, River Forest, IL. The project is the next generation of research and study of Dominican history and life in the United States. Interim Director Janet Welsh, OP (Sinsinawa) succeeds Sr. Nona and her work under the auspices of the DLC and its sponsorship of Project OPUS. Learn more about the Sr. Nona McGreal Center for Dominican Historial Studies. See more photos of the meeting. Read More about the DLC Annual Meeting.